The continued flow of exciting new stores onto the home interiors market leaves me feeling spoilt for choice. I no longer rely purely on the glossy interiors magazines for news of the latest shopping discoveries, at least not since twitter became my new little black book of contacts and addresses! 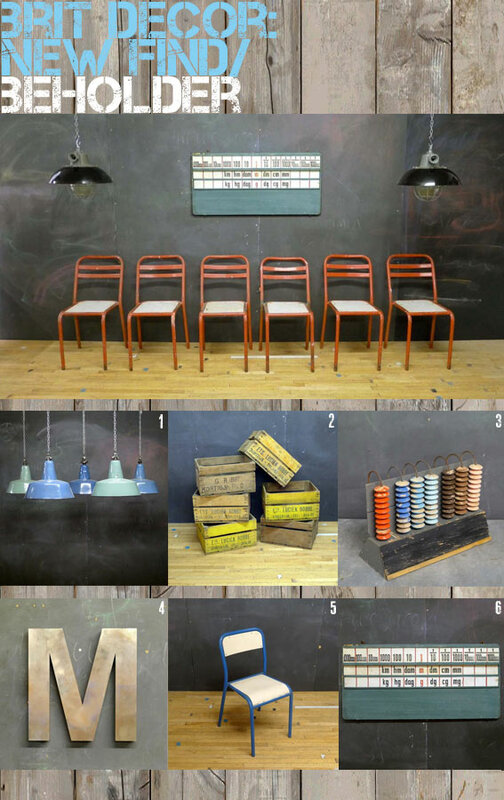 It was via this social media gem that I recently discovered Beholder a Bristol-based business which in their own words, collects and sells interesting items for domestic and commercial interiors. This collection is definitely perfect for the current trend in industrial design and for adding unique character to your home. My graphic designer's eye immediately honed in on the stunning yellow Dutch crates, which also look fantastic against the slate coloured wall and would also make a great magazine holder! Anything catch your eye?